Thought I’d repost this classic from last year. More related info soon. The dust-up at the university began in November when Kenneth Jacoby, a reporter for the Daily Emerald student newspaper, filed two public-records requests for emails exchanged between several coaches and officials associated with the football team. Mr. Jacoby asked for fee waivers for both requests based on his belief that the records were in the public interest. Nearly three weeks later, he was told it would cost over $700 to fulfill his request. He then got in touch with Mr. Harbaugh and in December filed a complaint over the cost with the Transparency Committee, which was established in 2010 to review university procedures for processing and fulfilling public-records requests. In an email to the committee on January 22, Mr. Harbaugh told members that they would be hearing Mr. Jacoby’s complaint the following day and discussing a response. The email, which was obtained by The Chronicle, included an attachment with Mr. Jacoby’s complaint letter. Mr. Harbaugh, a transparency advocate, files significant numbers of public-records requests in most years. In fact, according to the public-records office, he files more requests than any media outlet. The professor operates a blog, UOMatters, aimed at uncovering misdeeds at the university. In a 2015 profile by The Chronicle, Mr. Harbaugh said he hopes to make the university a “better place” through his transparency activities. Mr. Reed, however, said in an interview that he began to fear that the Transparency Committee was not, itself, being transparent, and that he was concerned about conversations he was being excluded from. In related news, GC Reed’s report on the Duck Athletic Department’s alleged efforts to stifle free speech by threatening to take away Jacoby’s press pass should be out in a week or two. Note: Just to be clear, I turned over all the emails that were covered by GC Kevin Reed’s request, and I did so at no charge to him. I’m still hoping he’ll take the high road w.r.t. our student-journalists public records request’s, someday. A university that spends millions of dollars on public relations ought to be able to find a few thousand for public records. 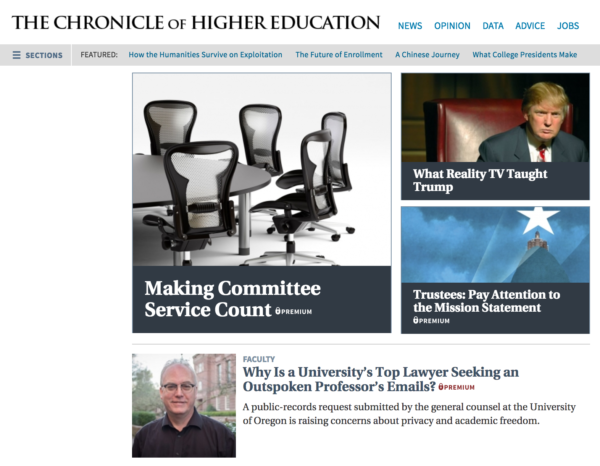 UO general counsel Kevin Reed is apparently the first university lawyer in US history – not just UO history – to use the public records laws to get a professor’s emails with reporters and free speech and academic freedom advocacy groups such as FIRE and SPLC. The University of ­Oregon’s top lawyer is using public ­records law to get a professor’s emails to and from reporters and editors of The Register-­Guard, The ­Oregonian, the ­Oregon Daily ­Emerald, The ­Chronicle of Higher ­Education and Inside Higher Ed. The lawyer, UO General Counsel Kevin Reed, sought any emails exchanged with those publications related to the University Senate’s transparency committee during the past year. I was unaware that Prof. Harbaugh was elected chair by email. I am unaware of any such vote taking place, though I was under the impression I am a member of this committee. This follows what appears to have been my exclusion from communication in recent weeks concerning Mr. Jacoby’s complaint regarding the PRO’s decision to follow its policy and not waive fees in responding to a request from the Emerald for student records. I understood that I was a non-voting member of the STC. It seems clear, though, that I am being left out of communications involving the core of the committee’s work. This scarcely seems consistent with the “transparency” part of the committee’s title. If I am not to be included in the communications of the committee, I decline to participate as a member. Please consider this a request, under the Oregon Public Records Law, of all communications made in in the past 12 months, between the current chair of the Senate Transparency Committee and members of the committee concerning the business of this committee, as well as all communications between the Chair of the STC and any members of the media concerning or mentioning the committee. I will excuse myself from any discussion by the committee regarding an expansion of the fee waiver policy, due to my belief that a discussion of the subject involving the Committee chair would involve a potential conflict of interest. Prof. Harbaugh was the most frequent requester of public records in the year just ended, and amongst those most frequently to withdraw his request for records when presented with the estimate of the costs associated with the production of those records. Since any action by the committee to demand a change in the PRO policies on fees and fee waivers, if adopted, would have direct financial impact on Prof. Harbaugh, I believe it would be a conflict of interest for him to participate in such a decision. Given Prof. Harbaugh’s participation in the matter thus far, I will refrain from participating in any discussion on the subject in the meeting unless he recuses himself, in order to avoid any appearance that I condone this conflict. I have attached the Public Record’s Office’s SOPs, setting forth its approach to fee waivers, for the committee’s information. It is unclear to me why the committee would be asked to “make recommendations” regarding the PRO’s balanced approach to fee waivers without presenting the committee with the actual policies implemented by the PRO. So, here they are. within the context of the records and the request, his request has been denied, and any request for fees is now mooted, a decision communicated to him last week. Any records are educational records of identifiable UO students and cannot be released without their consent. The Emerald is no longer being asked to pay fees for the responsive records, since there are no responsive records that can be produced without violating the federally protected rights to privacy of the students involved. includes any such communications from my non-UO hosted email accounts, or texts on my personal phone? 2) When you say “any members of the media”, are you including my communications with bloggers, and organizations such as SPLC and FIRE? 1) I seek all communications concerning or mentioning the STC you made in your capacity as an officer of the University Senate (Vice President, President or member or Chair of the STC), regardless of which media or device you sued for your communication. 2) No. I do not believe FIRE or SPLC qualify as “media.” If it helps in narrowing the search, please feel free to limit my request to communications with reporters, editors or other personnel associated with the Register Guard, the Oregonian, the Daily Emerald, The Chronicle of Higher Education or Inside Higher Ed. Please share any communications you have had with persons associated with the Foundation for Individual Rights in Education in the past 12 months, made in your capacity as an officer of the University Senate or member of any of its committees, which communications relate to or concern freedom of speech or academic freedom at the University of Oregon. … Altman found a few things that fit into the “you-can’t-do-that” category after Oklahoma defeated the Ducks 90-80 Sunday afternoon to close out the Phil Knight Invitational at Memorial Coliseum. “We put them on the free-throw line 44 times, I know a couple were late, but still 40 free throws when the game is on the line, you will not have much success,” Altman said. Oregon did not let any players speak to the media after the loss to Oklahoma that took away what likely would have been its best nonconference win. Oregon soccer takes a knee – what will Altman and Wiltshire do? 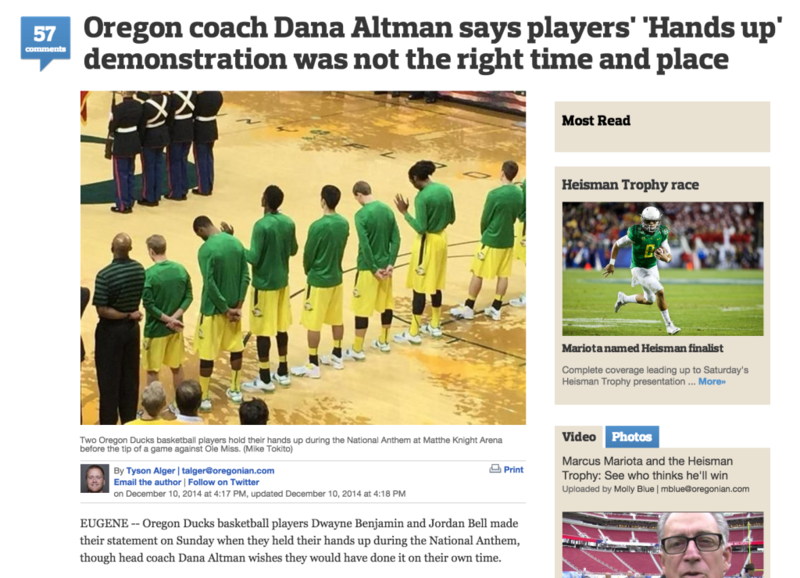 Three years ago two of Dana Altman’s Duck basketball players tried a Black Lives Matter protest during his national anthem. Altman chewed out his players and wouldn’t let them talk to the press afterwards. They never tried *that* again. while in uniform or on the field. That’s the rumor from down at the faculty club tonight. Jacoby: Yes — it’s happened to at least three sports editors at the Daily Emerald in the past four years, including myself. During our reporting of the Pharaoh Brown story this year, I directly called the football player whom Brown concussed, rather than requesting an interview with him through the athletic communications office. I had previously interviewed him within the athletic department’s interview guidelines, but one of the sports information directors was standing nearby during the interview, so I wanted to give the player a fair chance for final comment. After I called the player, the SID called me into his office. He said in his mind there were no exceptions to Oregon’s interview policy, and if the Daily Emerald continued to break protocol then the only recourse would be limiting our access. He said he was ready to pull our credential to the Civil War game on Nov. 26 but would let it slide one time with the expectation that it wouldn’t happen again. 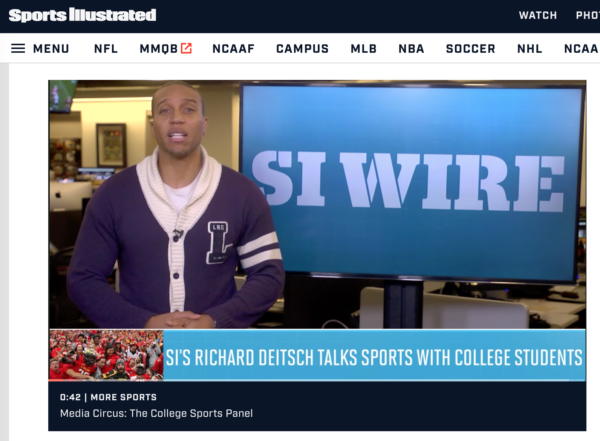 The university senate caught wind of the athletic department’s threat to revoke our credential. 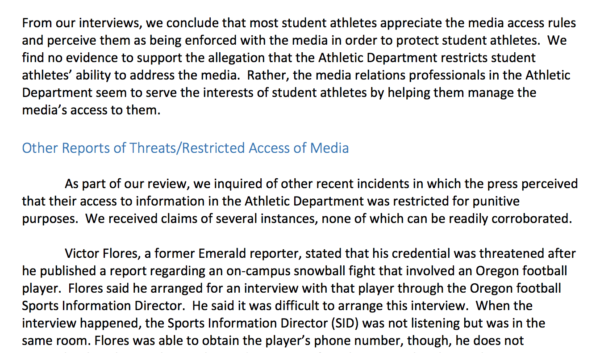 It requested the UO’s general counsel to investigate whether the athletic department’s interview policy and threat against the Daily Emerald were in violation of UO’s polices on freedom of inquiry and free speech, and on academic freedom. 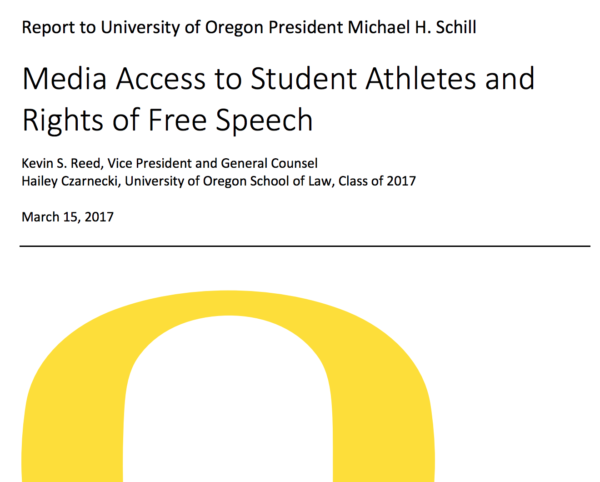 The latter policy states, “members of the university community have the right to investigate and discuss matters, including those that are controversial, inside and outside of class, without fear of institutional restraint.” The president of UO agreed to let the general counsel investigate the potential free speech violations; that investigation is ongoing. More on the UO Senate website here.